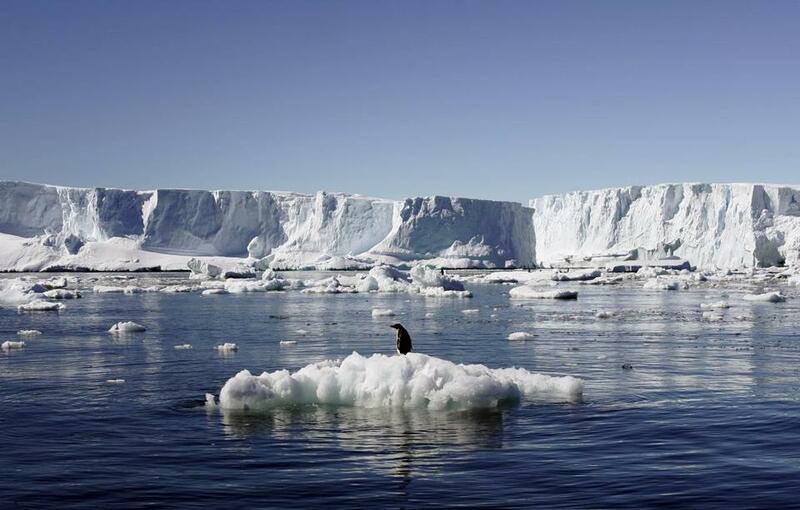 An Adelie penguin stood atop a block of melting ice near a French station in East Antarctica in this January 2010 photo. For some time, scientists who focus on Antarctica have been watching the progression of a large crack in one of the world’s great ice shelves - Larsen C, the most northern major ice shelf of the Antarctic peninsula, and the fourth largest Antarctic ice shelf overall. Larsen C, according to the British Antarctic Survey, is ‘‘slightly smaller than Scotland.’’ It’s called an ice ‘‘shelf’’ because the entirety of this country-sized area is covered by 350 meter thick ice that is floating on top of deep ocean waters. The crack in Larsen C grew around 30 kilometers (18.6 miles) in length between 2011 and 2015. And as it grew, also became wider - by 2015, yawning some 200 meters in length. Since then, growth has only continued - and now, a team of researchers monitoring Larsen C say that with the intense winter polar night over Antarctica coming to an end, they’ve been able to catch of glimpse of what happened to the crack during the time when it could not be observed by satellite. The amount of ice that could be lost would be around 6,000 square kilometers, or 2,316 square miles - nearly the size of Delaware, said O’Leary, a glaciologist at Swansea University and one of the team’s members, by email. So in sum, we’re talking about a possible ice island in the Southern Ocean that is as large as one of the smallest U.S. states. Moreover, researchers studying the widening crack in a 2015 paper - many of whom overlap with the MIDAS team - predict that after the loss of this ice, the remaining shelf could be unstable and continue to lose more mass. ‘‘If this will calve off in the next, say two orthree years, the calving front will be retreated very far back, further than we’ve seen it since we were able to monitor this,’’ says Daniela Jansen, a researcher with the Alfred Wegener Institute Helmholtz Centre for Polar and Marine Research in Germany. ‘‘And our theory in this paper was basically that the calving front might become unstable. Once the iceberg has calved off completely, there might be a tendency for the ice front to crumble backwards.’’ That could be further enhanced, she said, if warmer air temperatures cause the formation of large numbers of meltwater lakes atop the shelf. The fear is that something could then happen with Larsen C analogous to the loss of the smaller Larsen B ice shelf, which proceeded slowly - at least until it didn’t. ‘‘That took a while, but we think it might actually happen here as well,’’ Jansen said. Granted, there is at least an argument to be made that even a large loss of ice from Larsen C would not be immediately bad news for the global sea level. A study earlier this year in Nature Climate Change looked at ice shelves around Antarctica to determine how much area they could lose without ceasing to form their crucial function of buttressing glaciers and holding them in back, and found that Larsen C actually has a lot of ‘‘passive’’ ice that it can lose without major consequences.